Studies estimate that 2 million US children have been exposed to a wartime deployment of a military parent in the past 10 years. Some of those children experienced repeat deployments of a parent while other children experienced both parents being deployed. Parental deployment can stir up a variety of emotions in children, ranging from fear and anxiety to anger and sadness. And it can lead to a variety of academic and behavioral challenges for children. So it’s important for parents, caregivers, and other adults to recognize how military deployments affect children. Since the Vietnam War in the 1960s and ’70s, the military’s demographic has changed. At that time, only 15 percent of active-duty troops—who were nearly all men—were also parents, so the hardship on children was neither prominent nor researched. As of 2014, though, according to the Department of Defense research, 42 percent of military personnel now have children. Consider children who were just beginning to remember events in their life as 9/11 occurred—these youth are now in their late teens and early 20s, and a country at war is all they’ve ever known. Deployments average 3 to 15 months. And sometimes, they occur during peacetime. Most families do well after peacetime deployments since these deployments are usually safer and shorter in duration. Wartime deployments, however, can be the most stressful for families—especially children. When most people think of deployment, they most likely imagine a tearful goodbye or a parent who has already left. But that’s only a small part of the overall picture. Pre-deployment: During the days and months leading up to deployment, service members and their families may experience a variety of stressful events, such as dealing with legal issues, creating a will, or assigning a power of attorney. Children may feel confused or anxious about what will happen to them. Deployment: When a parent is deployed, a child may experience a sense of emptiness, loss, and abandonment. Some children develop new coping skills and gain more independence during this time. The anticipation of a parent returning can be filled with worry and excitement. Post-deployment: Families often experience a “honeymoon phase” after reuniting. But shortly after, many begin to struggle to readjust to family life. Many things have likely changed during a deployed parent’s time away. Problems with adjustment can be especially problematic if the parent who was deployed develops post-traumatic stress disorder. Every child will react differently to a parent’s deployment; however, age generally plays a role. It’s never too early for a child to react to the deployment; research shows that even infants display signs of being affected by a parent’s absence. Young children don't understand deployment and they are more likely to struggle with the changes in family dynamics. They may need frequent reassurance that they are loved, will be safe, and did not do anything to cause the parent's departure. Studies show pre-schoolers with deployed parents reveal higher emotional reactivity, anxiousness, depression, somatic complaints, and withdrawal. They may also show separation anxiety from the parent who remains, start throwing temper tantrums—or increasing their severity—and change their eating or sleeping patterns. Studies show the at-home parent’s level of stress is the most significant predictor of a school-age child’s psychological well-being during a parent’s deployment. Researchers also discovered that children with parents who were younger, had been married for a shorter period of time, and were junior enlisted rank were at a higher risk of psychosocial problems. School-age children with a parent deployed were 2.5 times more likely to receive “high-risk” scores for emotional and behavioral problems when the Pediatric Symptom Checklist was used. They were also more likely to experience sleep problems. 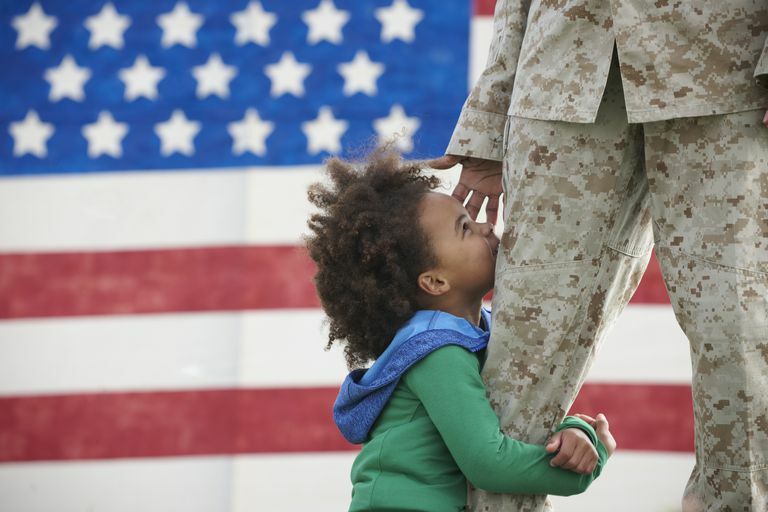 When a parent is deployed for combat, the psychosocial effects are likely to persist after the deployed parent returns home. A study that examined adolescents whose parents were deployed overseas, found that teens were likely to experience anxiety about the deployed parent’s well-being. Their academic performance was also more likely to decline. On the positive side, teens were more likely to exhibit increased responsibility and maturity. Teens are more likely to experience emotional difficulties when their parent is deployed longer. The at-home parent’s mental health also makes a big difference. An at-home parent with positive coping skills is more likely to have a teen with fewer maladjustment issues related to deployment. Being the at-home parent when a partner is deployed can be stressful. Not only might you have to pick up a lot of extra childrearing and household duties—you're also likely to experience emotional turmoil related to having a deployed partner. There’s added pressure, though, since the attitude and behavior of the parent who’s still at home can impact how a child reacts to a deployment. A child quickly picks up on how mom or dad is feeling about the other parent being away. If an at-home parent is worried about the safety of the military member, the child will likely be worried as well. Therefore, self-care for grown-ups is of utmost importance during this time period. Have the other parent read a bedtime story or make a video. If you are able to create a recording before the other parent is deployed, seeing or hearing the deployed parent’s voice may bring some comfort. Talk about the deployed parent on a regular basis. Sometimes the at-home parent fears talking about the deployed parent will be too hard on kids. But talking about the situation and the other parent can bring comfort. Foster communication with the deployed parent. If phone calls are allowed (and kids aren’t likely to hear scary things during the call) facilitate conversations. You might also encourage your child to write letters and draw pictures for the other parent. Limit media coverage for younger children. If the parent is in a dangerous military zone, news coverage will overwhelm younger children. If you allow older children to access the news, hold regular conversations about what they’re seeing and learning. Talk about war. Find out what your child knows about the military and conflict. Just make sure you hold conversations about war in a kid-friendly manner. Talk about your child’s feelings. Check in with your child regularly to talk about feelings. Make it clear that it’s OK to feel a variety of emotions, like sad, scared, and angry. Validate your child’s feelings and talk about healthy ways to cope with those emotions. Maintain a sense of routine. It’s important for children to have structure. And a regular routine can help kids feel safe even when their lives are a little uncertain. Don’t talk about the stress of dealing with deployment in front of your child. Don’t burden your child with information about how difficult or scary it is to deal with deployments. Keep those conversations out of earshot from your child. Create a scrapbook to share with the other parent. Encourage your child to put pictures, stories, and mementos into a scrapbook that can be shared when the other parent returns home. It can help your child stay active and positive. Provide plenty of one-on-one time. Your child may need some extra attention while the other parent is deployed. Set aside a little time each day to offer your undivided attention. And try to schedule longer opportunities to spend quality time together on weekends and during vacations. Keep the household rules the same. Continue to implement the same discipline strategies you use when the other parent is present. Enforce the rules and use the consequences that were in place prior to the other parent’s deployment. Access resources offered by the military. From summer camps for children with deployed parents to websites where children can connect with other children who are facing similar challenges, the military offers families a variety of resources. Access these resources for your family and connect with other military members who understand your circumstances. Take care of yourself. Managing your own stress and taking care of your health will go a long way to helping your child. If you are struggling to find healthy ways to deal with your partner’s deployment, talk to your doctor or seek services from a mental health professional. Seek professional help. If you notice changes in your child’s mood or behavior that last for more than a couple of weeks, talk to your child’s pediatrician or contact a mental health professional. Or, if your family is struggling to adjust to the changes once the deployed parent returns home, seek help from a professional who understands the needs of military families. It’s not easy for anyone in the family, whether it’s a spouse or child, to deal with deployment. However, children are remarkably resilient and, with a little help, the whole family can adjust to the realities of life in the military. Alfano CA, Lau S, Balderas J, Bunnell BE, Beidel DC. The impact of military deployment on children: Placing developmental risk in context. Clinical Psychology Review. 2016;43:17-29. Nelson SC, Baker MJ, Weston CG. Impact of Military Deployment on the Development and Behavior of Children. Pediatric Clinics of North America. 2016;63(5):795-811. Siegel B, Davis B. Health and Mental Health Needs of Children in US Military Families. Pediatrics. 2013;131(6). Trautmann J, Alhusen J, Gross D. Impact of deployment on military families with young children: A systematic review. Nursing Outlook. 2015;63(6):656-679. U.S. Department of Defense: Military Children Serve, Too. Why Are Test Scores of Gifted Children Not Always Accurate? How Do Child Support Payments Impact Public Assistance?